On sad days of remembrance, and days when I feel hopeless or out of control, eventually I find myself in my garden. Today, I marked the anniversary of 9/11 by planting trees, something I did on this afternoon ten years ago. Ten years ago, I watched the news coverage in horror and disbelief until I couldn’t stand it anymore, and then went out to the garden. The dogs came with me, and they played while I planted a yellowwood (Cladrastis kentukea). It wasn’t a special tree—just a native tree that had been patiently waiting to be planted. That tree became my own personal memorial to 9/11. I fully realize that my single, solitary act of planting a tree couldn’t possibly change anything. It didn’t even bring comfort to anyone else, but it certainly did to me. That’s because working in a garden is comforting. Caring for plants offers a perfect opportunity for quiet contemplation. In 2001 and again today, I found myself thinking about the individuals who were killed, the families who had lost loved ones, and the way our lives have changed in the interim. As I dig holes, remove grass, work in the soil, and just sweat, I also simply stop thinking. That is comforting in and of itself. Today, my two best garden-companion dogs, Bing and Casey, helped me create my own personal memorial of the tenth anniversary of 9/11. They lounged in the shade while I planted an oak tree, a tupelo (Nyssa sylvatica), and a fringe tree (Chionanthus virginicus). The first two were added to the throng of plants covering the hillside along the road. The fringe tree will anchor a new section of the garden that will keep me busy, and planting, and contemplating for the foreseeable future. 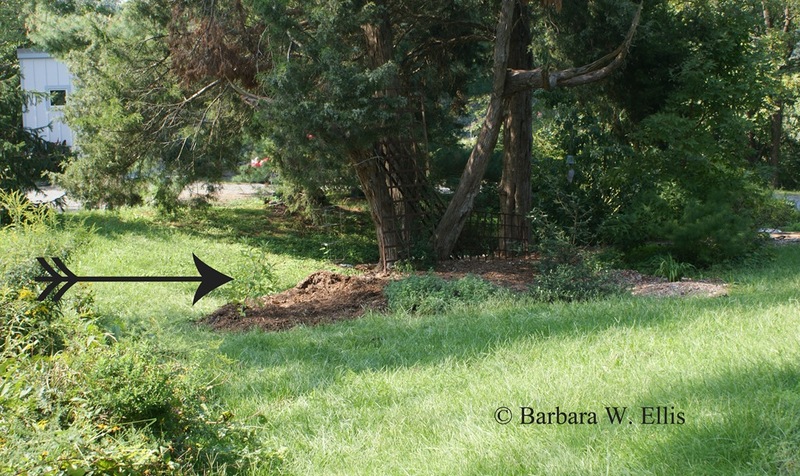 Above: Barely visible, the newly planted fringe tree is situated on a peninsula of mulch that connects it to an existing bed and also marks the garden’s next expansion. Thanks for the encouragement. Planted a Cornus racemosa that has been waiting in my driveway. More life! After turning on the TV this morning and finding nothing but 9-11 rememberence, I decided to go out to my gardens and tend to them since I had two weeks worth of catching up to do. I as well thought of all the families and how our society has changed since this horrific act of terrorism.